Yuba Bikes specializes in cargo bicycles, bikes made to haul a variety of loads from groceries to restaurant deliveries to even families. 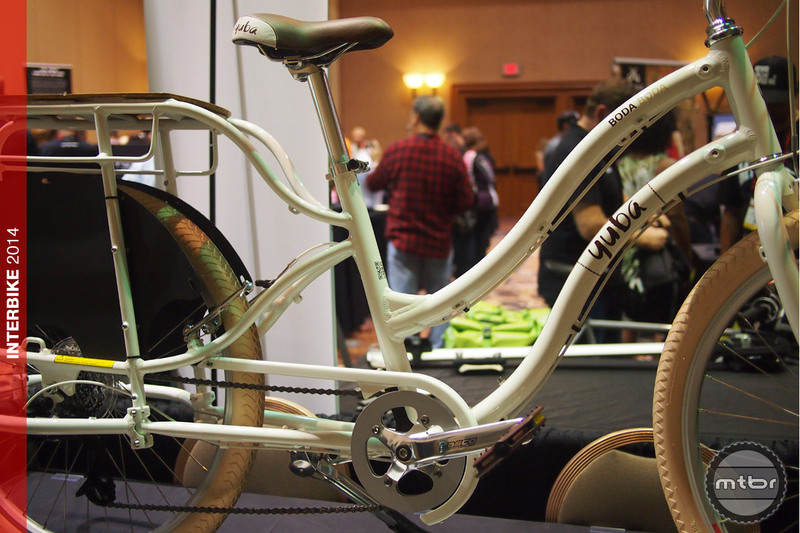 We remember seeing Yuba Bikes at the Sea Otter Classic many years ago, they have been around since 2006. 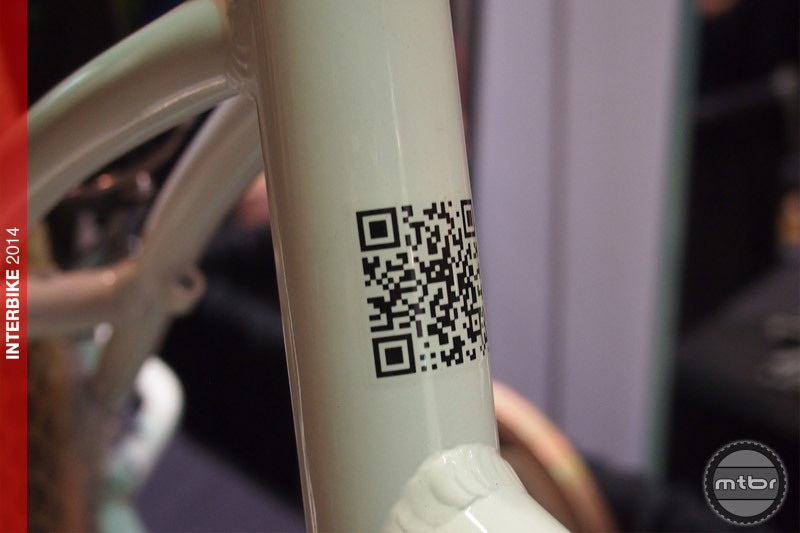 At the Interbike Preview show, we had a chance to chat with Ben Sarrazin, Founder of Yuba Bikes as he showed us 3 new bikes from his line. In talking with Sarrazin, it is obvious that using the bicycle as the main mode of transportation is something that he is passionate about. He talks about using the bike to drop off the kids at school in the morning, bike to the office, and then pick up groceries on the way home. Given his European upbringing, his outlook makes sense and getting more people out of cars and on bikes is definitely a worthy cause. The base model Mundo has an MSRP of $1299 and the electric version with BionX hub motor has an MSRP of $3199. Both are available now through your local Yuba Bicycles dealer or via the Yuba Bikes website direct. Next up, Sarrazin showed us the Boda Boda. Our first question was, “what the heck is a Boda Boda?” It is named after the motorcycle taxis in Africa that take passengers to the other side of town or are used as delivery vehicles for restaurant owners that need 5 kilos of rice picked up from the market. 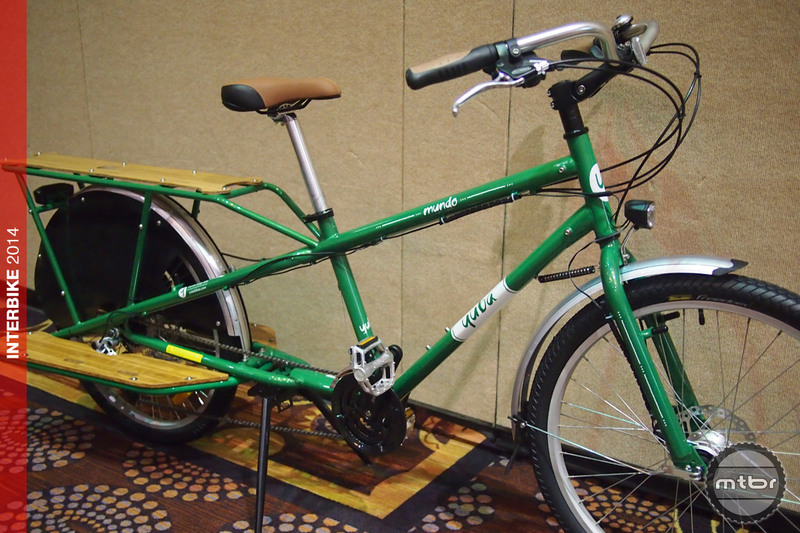 The Yuba version Boda Boda is a lighter, more compact cargo bike without the superlong wheelbase. It has front basket options, pannier options, handles for passengers and other options as well. 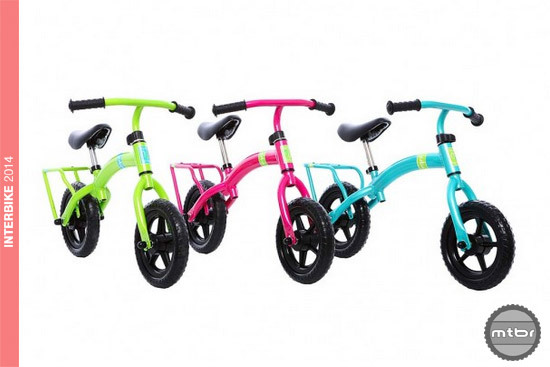 It has a step-thru frame for women riders or shorter riders. The Boda Boda has an MSRP of $999 in either traditional or step-thru frame and the electric version (called the elBoda Boda ) has an MSRP of $2899. Both are available now through your local Yuba Bicycles dealer or via the Yuba Bikes website direct. 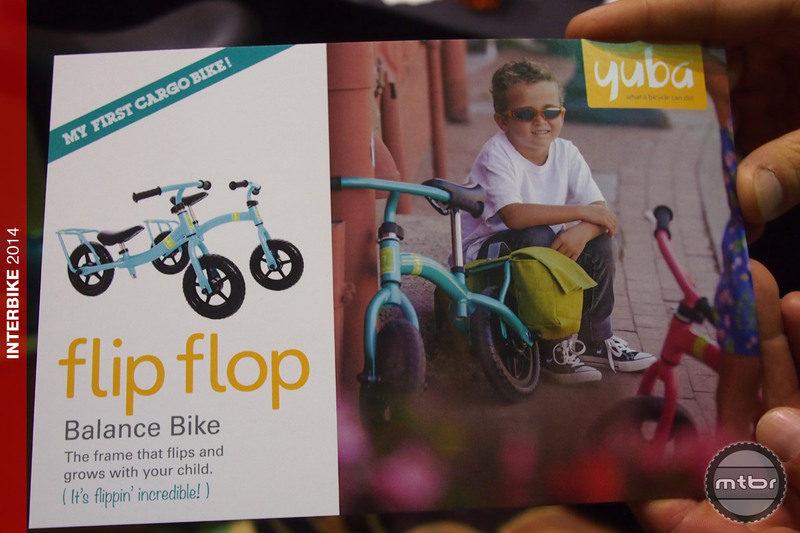 Brand new from Yuba is probably the world’s first kid’s cargo balance bike, called the Flip Flop. For the kids of parents who have cargo bike, the Flip Flop gives the kids a chance to carry their own cargo like their toys or snacks, by providing a rear rack for a small pannier style pack. But why is it called the Flip Flop? 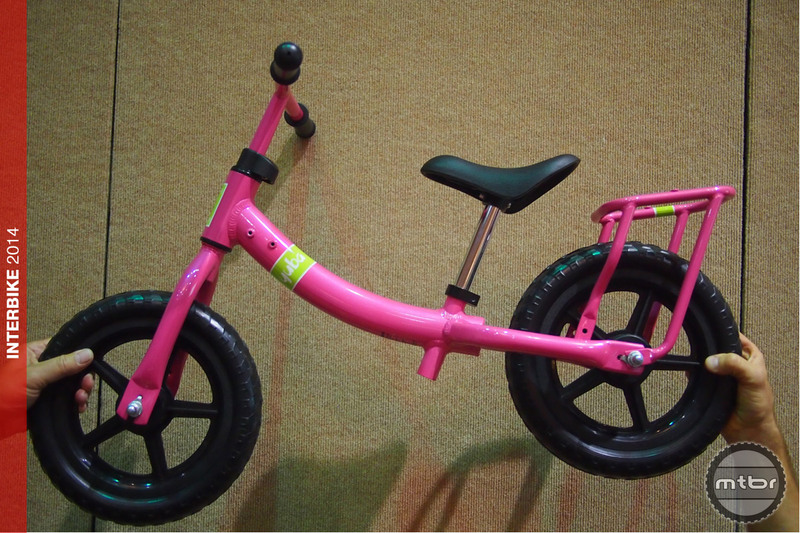 The biggest feature of this little bike is that the entire frame can be turned upside down to create a bigger bike, thus extending the usable life of the bike. 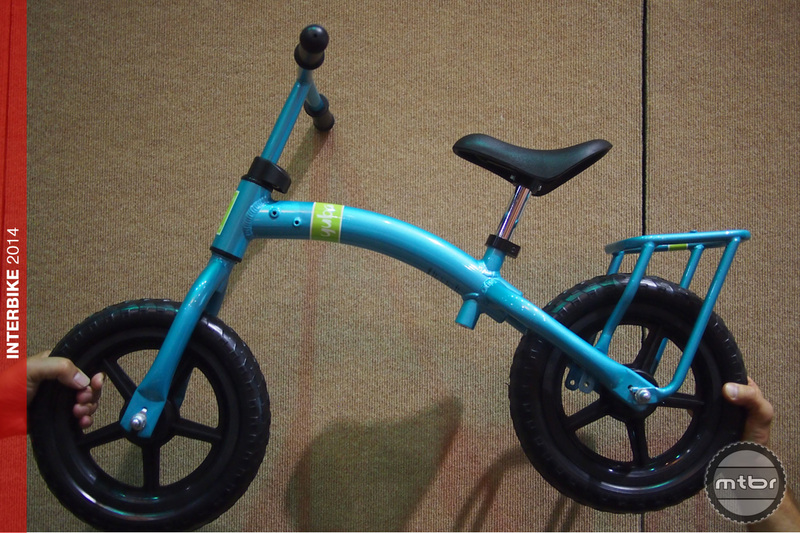 Yuba says the bike can be used by kids from 1 and a half to 6 years of age. As any parent knows, the fact that kids outgrow things so fast (toys, clothes, bikes) building something that can change and grow along with them is a pretty cool thing. By flipping the bike over, the seat is higher and the geometry also gets raked out just a bit. Also, the handlebars are adjustable and can be raised and lowered (as well as the saddle) and the rear rack will still fit. If you noticed the two holes on each side towards the front of the frame, that is made to hold a small, soft pack in front for small items. The Flip Flop is available in 3 colors (lime, raspberry, aqua) and has an MSRP of $159.99 and will be available November 2014. For more information or to order direct, visit yubabikes.com.